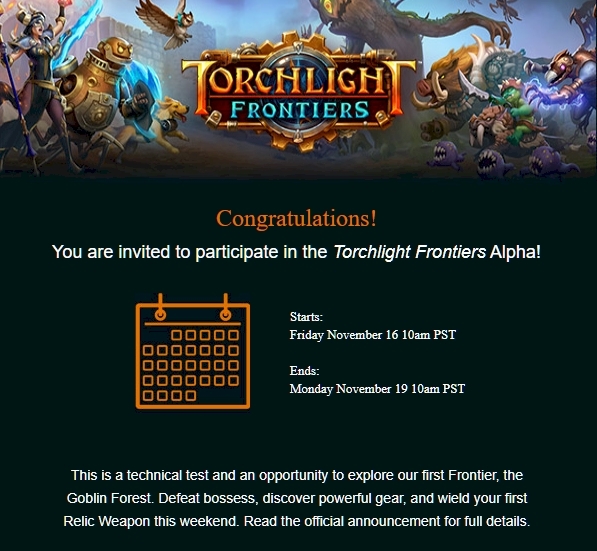 The weekend before last I was invited to an early Alpha test for Torchlight Frontiers. This Alpha invitation came along with an NDA, but it was only mentioned that you couldn’t post pictures or video of the game, but they didn’t say I couldn’t write about it, so here we are. I jumped in on that Saturday and got down to business. As of now, there were only two character classes to choose from, a mage type and a melee class that is a steam punk robot of sorts. There was the first “frontier” to explore, this one dealing mostly with Goblins. Apparently each of these frontiers will feature different mobs but also different sorts of resistances you’ll need to success, and this is where their “horizontal progression” stems from. You’ll have to gear up differently for each frontier, which means you’ll have to have different gear sets for each area of the game. Or so that’s how it’s been presented thus far. Graphically you can tell this is still a Torchlight game, though it does seem to be more of a hand drawn art style rather than a low poly one like the original two games. I liked the look of the game, the areas were interesting and there was a decent variety of mobs. There were plenty of other people running around killing things too, and this feels like the closest thing to Marvel Heroes that we’ll have now that Marvel Heroes is gone. I wasn’t a huge fan of that particular title, but I did play it a bit and it has that same feeling of playing alone but having a bunch of other people running around the same area do similar things. 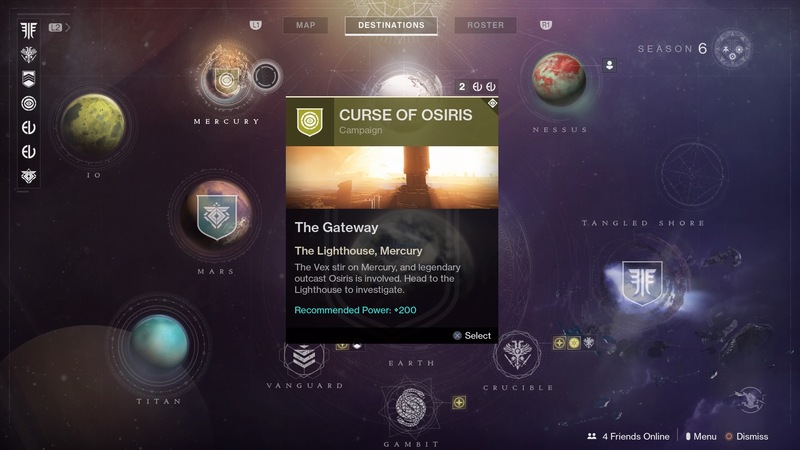 I imagine there will be grouping and public events too, but we’ll see. Server stability was the only real issue I had. When I would run into others there was some lag, but it wasn’t anything too terrible. I honestly don’t know if it was the server or my Internet, so I’m not going to knock them for it. My overall opinion of the game is that it looks solid, but I didn’t really put that much time into it. I’m sure in further Alpha tests there will be more to check out. I didn’t really care for the classes on offer and hope that there are some more interesting ones next time. I did like the idea of your own fort where you can get new vendors and things so you have a home base of sorts. This would be optimal for storing all of that gear you’ll need for different areas of the game. It would be nice to have guild functionality as well so that you could meet up with friends and do things together with your base as a starting point. I’m sure we’ll see more developments as time goes on, but for now it looks like a promising title. It hasn’t been that long since I first mentioned the game, having heard about it a few months back. Since then there has been chatter about what the devs intended to do via horizontal progression and whatnot. I have been intrigued for a while, and with Blizzard blowing off Diablo IV in favor of the mobile Diablo Immortal, I have to find my ARPG fix elsewhere. I’ve been pinning my hopes on this title since then, and I’m hoping to get some time in over the weekend to check it out! Installation requires a download of Perfect World’s “Arc” launcher, which hosts other games like Star Trek Online and Neverwinter, but was something that I didn’t have installed. It seems to have improved a bit since I last used it, but otherwise looks similar to Battle.net or Steam. I hate having a launcher installed for a single game, but it is what it is. I’ll be sharing my impressions of the game after the weekend. There is an NDA, but it only says that you can’t post photos or video of the game, which means you’ll get a wall of text impression post, but I will share my thoughts nonetheless. 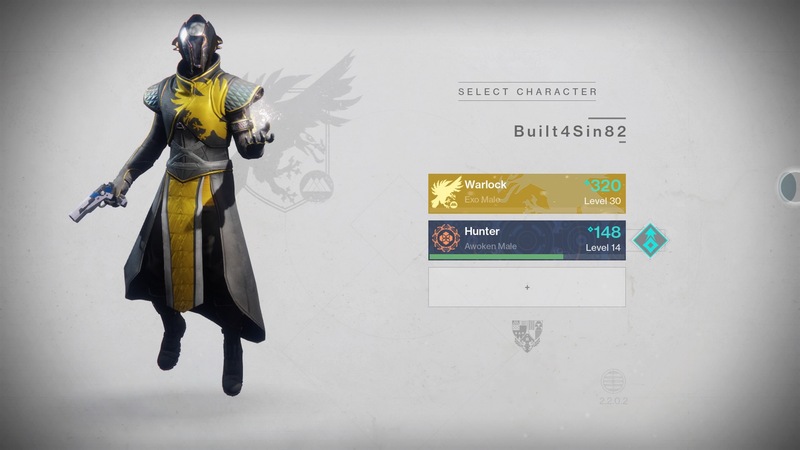 Apparently my account name is built4sin82 (same as on PSN), so I assume you can add that as a friend if you want to try and play together this weekend. I’m not sure exactly when I’ll play but drop me a line if you want to try and meet up. Hellgate: London arrived during a time was I was fairly addicted to MMOs and set out to try most that I could get my hands on. The game originally released in Q4 of 2007, but it didn’t hit my radar until early 2008. My father turned me onto the title, but I had read mixed reviews at the time and didn’t want to buy a copy until he had insisted that it was a decent game. I wrote about it a few times here on the blog back in 2008, but my writing style at the time was pretty attrocious so there wasn’t much detail on my thoughts. I remember it being something that I enjoyed, but it certainly wasn’t the best thing I had ever played. The developers, Flagship Studios were bankrupt by 2008 and the servers were down by early 2009. By then I definitely wasn’t playing it anymore. Belghast was talking about missing the IP and wishing someone would do something with it again and that reminded me that it even existed. From my memory, it was an Action RPG of sorts but could be played in either third or first person view. It was still the same sort of hack and slash loot box that we’ve come to expect from games like Diablo, but as it was created by ex-Blizzard devs this would make sense. Originally there was a single player campaign and the ability to go online to group up and play through the game. Sounds a lot like a modern ARPG despite being over 10 years old, doesn’t it? As of this week, there was an announcement that the game would be coming to Steam. There is already a page up on the Steam storefront, as a matter of fact. It’s pretty short on details, and it appears that someone who doesn’t natively speak English wrote up the description. From what we can see there, it’s focusing on the single player element and mentions Hellgate: Tokyo, which I had to look up on Wikipedia to figure out exactly what that was. Apparently in the years following the shutdown of Flagship studios and the game’s servers in 2008-09, an Asian company picked up the rights and made a new version of the game that included areas of Seoul, South Korea instead of London. There was also a development in 2014, where a title called Hellgate: Global was announced to incorporate all versions of the game into one and redistribute into the west. Or something to that effect. Whatever the case, this is “version 2.0” which sounds like it includes pieces of content I may not have seen. I never beat the game either, so it goes without saying that I missed a bit. It’s unclear if it’s going to hold up graphically as it’s an old engine, but the screen shots don’t look terrible, probably because most MMOs are running on ancient graphic engines. Perhaps there is some scaling tech there, I would imagine we’ll be able to run higher resolutions and make the game look halfway decent. If the gameplay is as enjoyable as I remember I will definitely be checking this out when it shows up in November. It’s unclear if this will be free to play or buy to play but I doubt there will be a subscription like there used to be. Though, it was always optional and I’d be okay with an optional subscription if it proves to be worth it. I’ll be keeping my eyes on this one for the next few weeks to see if any new information arises. 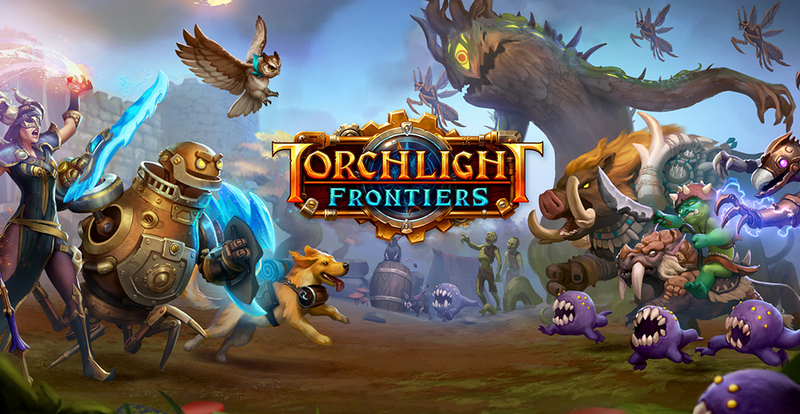 A little over a month ago, I first jotted down some thoughts about the upcoming MMO Torchlight Frontiers, a game many of us thought would never see the light of day. I signed up for the beta, which we have no idea when will happen, but this also means being subscribed to their newsletter, and the first new tidbits of information have started to trickle through. The email I received linked to a post on the Arc Games website, which makes sense due to this being a game produced by Perfect World, and Arc being their launcher. 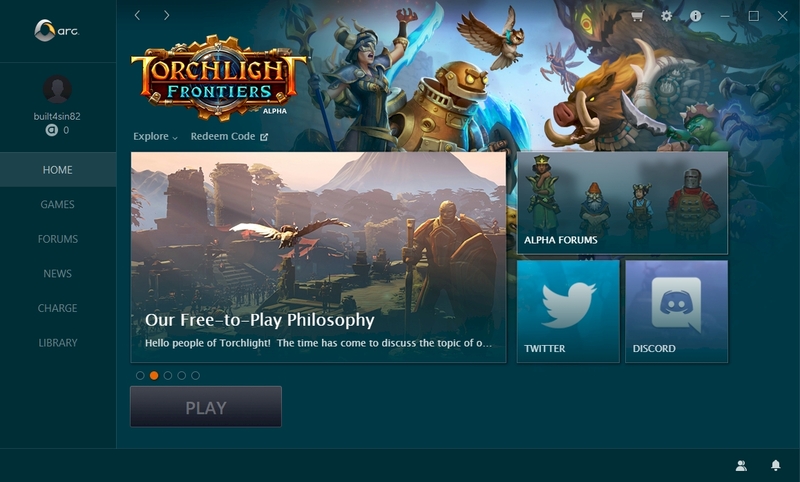 The article in question is about how Torchlight Frontiers will have “horizontal progression.” You can read the full story there, but I have cherry picked some interesting points because this is a topic that is near and dear to my heart. In most MMOs, or RPGs for that matter, there is always a sort of vertical progression, in that you’ll gain levels of experience opening up new gear and new areas of the game, but this all comes to a screeching halt once you’ve hit the level cap. Then we’ll be subject to the developers’ ideas of what “end game content” should be. Sometimes these activities can be amazing, and other times things are too systematic and boring. In games like the original Everquest, the level cap stayed the same for a very long time, and things like Alternate Advancement points could be earned to still give a sense of progression, but without negating parts of the end game once a new expansion came out. In other titles like World of Warcraft, you’ll see things like Garrisons or Artifact Weapons being introduced just to be thrown in the garbage bin during the next expansion. Echtra Games is attempting to get away from this model. These bullet points are key, and I think they have the right ideas when it comes to trying to build a world that has progression, but doesn’t throw other bits out the window just for the sake of a level cap increase. It sounds like specialization will equate to having some sort of alternate advancement system, most likely skill points in various trees. 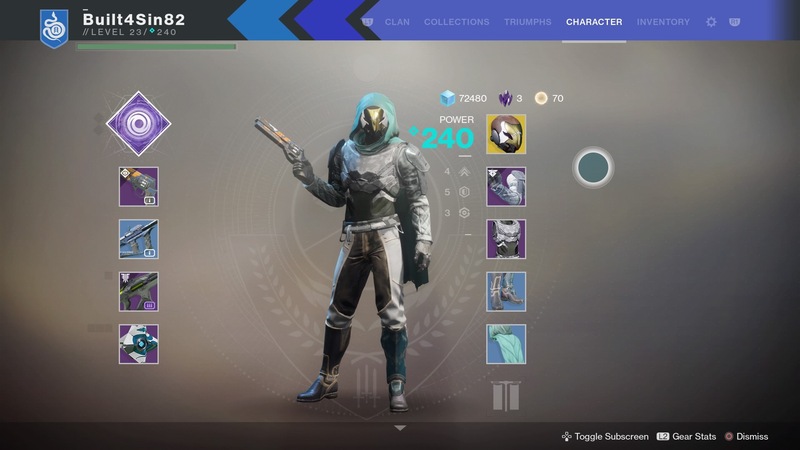 There’s also some scaling tech being used to help these systems to work and allow people new to the game to play with veterans. Take that same gear to the Hyvid Frontier and it scales worse – you’re behind the monsters’ level. You have some useful stats, but it’s clearly better to start collecting gear from the local Frontier if you want to progress at a good pace. Gear scaling is an interesting idea, but scaling isn’t something new. Clearly they have drawn inspiration from Guild Wars 2, but we’ve seen similar concepts in games like The Elder Scrolls Online. I like the idea of “Frontiers” which sound sort of like Diablo III‘s end game content, but where each is dependent on different stats and thereby different gear so each Frontier will feel like it has its own progression without needing to scale arbitrary levels. The post goes on to tease about other ways these systems will work together to fulfill the horizontal progression goal. It will be interesting to see how this unfolds. I’m curious to see just what other features they are looking to implement, but thus far it all sounds very promising. This is also wrapped up in an Action-RPG package, and these games tend to be pretty addictive in and of themselves. My only concern here is if there will be enough to set Torchlight Frontiers apart from other successful ARPGs — Diablo III does feel like its nearing the end of its lifespan, but games like Path of Exile are still going strong and have dedicated playerbases. If they can find the right mixture of new features and exciting gameplay I think we might have a damn fine game on our hands. We’ll have to keep an eye on it.